The finish on any project has two purposes: to beautify the wood and protect it. However, if you have built your furniture from rot-resistant and stable wood, you may choose to leave the wood unfinished. This cuts down substantially on maintenance, because once a finish is applied, it must be renewed periodically. 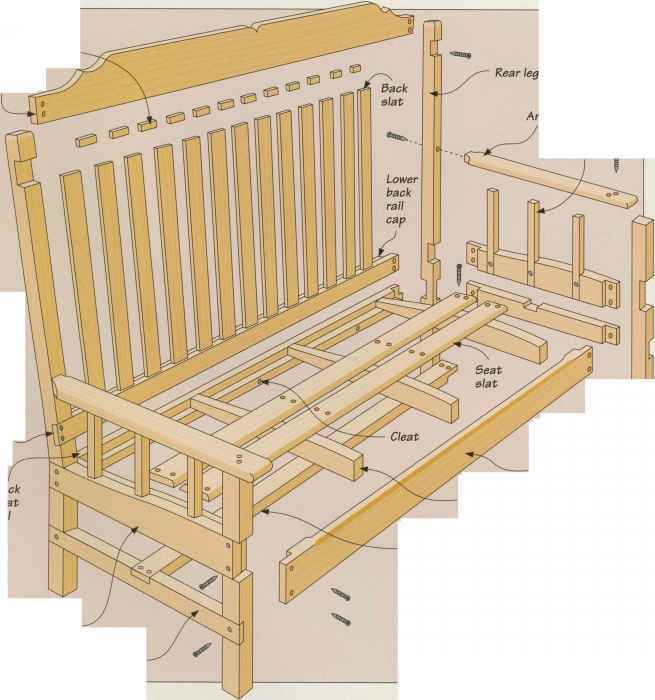 Still, for the less decay-resistant woods, finishing is your best choice to protect the furniture from the elements and to keep insects at bay. Also, some woods with little figure may look better covered with paint or a stain. A pigmented topcoat will also conceal any mismatched grain. The most common finishing choices are penetrating oils, varnishes, and paint. Spar varnish requires that the first coat be thinned, with undiluted varnish for the subsequent coats. Other finishes, especially paints, need a sealer first, followed by primer, then the finishing coats. Water is not the only threat to outdoor furniture. Sunlight can damage wood by destroying the lignin in the wood, which fortifies the cell walls. If you want to shield the wood completely from the sun, use paint. Generally, the higher the gloss, the better the protection, since the gloss will serve to reflect the sun's rays. Some finishes, such as spar varnish, contain ultraviolet (UV) filters, which help shield the furniture from the sun's harmful radiation. For maximum UV protection, apply four or five coats. Finally, do not expect a finish to salvage a poor construction. While there are very expensive finishes available, such as catalyzed linear polyurethane, that will protect wood from virtually anything, including submerging it in water, the best way to ensure that your piece of furniture lasts is to start with the right joinery and glues. One of the solutions to finishing is not to do it. 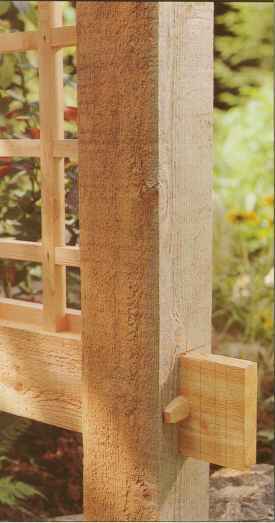 The arbor shown at left is made from cedar, which contains natural pesticides, making it extremely resistant to rot. The only maintenance required is to scrub away dirt and mildew occasionally. The wood will eventually turn a silvery-gray color. In general, dark woods tend to lighten over time, while light woods darken.